When just starting out online whether you are blogging or just posting on Facebook or other social media, it’s really hard for people to take you seriously unless you already are an authority in something of importance. So how can you prove and earn instant credibility? These three techniques work quite well. It’s just a matter of applying them to your online content. The first thing to do is to openly argue against your own interests. Say what? You mean I should tell people that they should not buy what I am promoting? Correct! What if you are promoting a particular product that would help newcomers to the online make money community? Would you want to sell your product to those who know much more than a newcomer just for the sake of a sale? Some would! But what if you are truthful and explain that your product is NOT for them and that they should NOT BUY IT! Down the line, you may just have a product that would, and certainly could, make sales just by being transparent today. Putting others before your sales earns you instant credibility. Secondly, people will believe you if you give precise numbers. This infers credibility. Don’t just say that your Alexa ratings have fallen, give precise numbers. 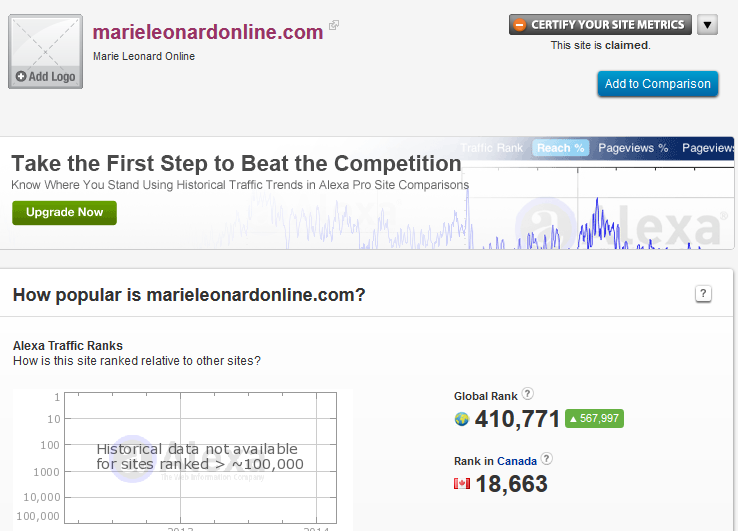 For example, my website, Marie Leonard Online, has steadily been dropping in the Alexa ratings for the past month. It is now sitting at 410,771. And I attribute that to the wonderful work I and my webmaster have been doing in re-vamping my site and branding my profile to be more of a cohesive model than scattered into several different directions. The last tactic may seem obvious, but when you make a claim about something important be prepared to prove it. You can either use academic studies or real live snapshots of what is going on. Here’s a snapshot of the Alexa ranking I mentioned above. I was prepared to prove what I said in numbers with actual visual proof. However, what if you can’t find proof? Then, look for testimonials, logos, awards and even research on the topic that mentions what you are talking about. Anything that comes NOT FROM YOU and can back up what you are presenting can add credibility to your content. Taking a serious but fun approach to your online branding does not mean that you have to lie. You will find you get more by being you.